Dissection … teaches us that the body of man is made up of certain kinds of material, so differing from each other in optical and other physical characters and so built up together as to give the body certain structural features. Chemical examination further teaches us that these kinds of material are composed of various chemical substances, a large number of which have this characteristic that they possess a considerable amount of potential energy capable of being set free, rendered actual, by oxidation or some other chemical change. 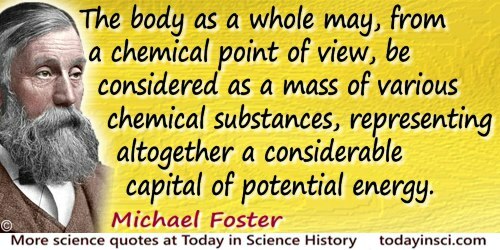 Thus the body as a whole may, from a chemical point of view, be considered as a mass of various chemical substances, representing altogether a considerable capital of potential energy. From Introduction to A Text Book of Physiology (1876, 1891), Book 1, 1. The structural formula of the organic chemist is not the canvas on which the cubist artist should impose his drawings which he alone can interpret. 'A Pragmatic System of Notation for Electronic Valance Conceptions in Chemical Formulas', Chemical Reviews, 1928, 5, 558-9. 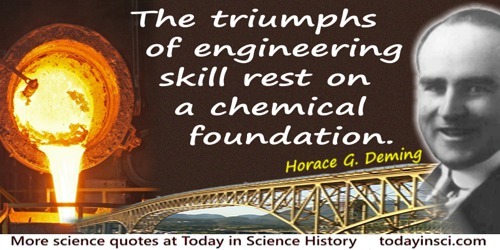 The structural theory of Kekulé has been the growth hormone of organic chemistry. The Theory of Organic Chemistry (1941), Preface, v.
[T]he phenomena of animal life correspond to one another, whether we compare their rank as determined by structural complication with the phases of their growth, or with their succession in past geological ages; whether we compare this succession with their relative growth, or all these different relations with each other and with the geographical distribution of animals upon the earth. The same series everywhere! In Essay on Classification (1851), 196.